All of us will have come across those internet contracts (aka End User License Agreements, aka EULAs). You know the ones: they say “Terms and Conditions of Use” and you scroll down about 20 clauses, and click “I agree” at the bottom. Because I’m a contract nerd, I do actually sometimes read them out of fascination, but I suspect I’m in a minority. What happens if you get your pet to click “I agree” on your behalf? Are you still bound by the contract? Is the pet bound by the contract? As Anne Loucks notes, most people don’t even bother to read these agreements. She decided that she might get her cat Simba (pictured above) to agree to a software license. Her experiment involved tempting Simba with food so that he stepped on cardboard placed on top the keyboard and clicked “I agree”. The cardboard had the words “Kitty Agrees” on it. I’m afraid that I don’t think the contract would be binding. You know I’m obsessed by animals and the law, and I think that Simba does not have the cognitive skills to understand the ramifications of what he is doing. Perhaps (it’s an interesting question) a very intelligent chimpanzee with a good command of sign language could enter into a contract, although there would still be questions as to whether the chimpanzee should be treated as analogous to an infant entering a contract. Actually, I don’t think cats really understand the concept of “agreement” period. It is alien to their being. A cat does whatever he (or she) wants to do. A cat simply momentarily condescends to acquiesce to your request. It has been accurately said that people own dogs, but cats own people. Anyway getting the cat to walk across the keyboard is a bit like pressing the keyboard with a ruler – the cat is a creature under your control has temporarily agreed to accede to your control by reason of a food bribe and therefore what it does is imputed to you. But it makes a nice point about the pathetic nature of those EULAs. This entry was written by Legal Eagle, posted on at 9:48 pm, filed under Animals, Fark!, Internet, Law, Technology and tagged cats, contracts, EULAs. Bookmark the permalink. Follow any comments here with the RSS feed for this post. Post a comment or leave a trackback: Trackback URL. A few years back I saw software that had modelled the types of keystroke sequences that cats caused and ran in background so that when kitty ran across the keyboard, it somehow turned off the keyboard for some time. I’ve drafted the odd EULA. I’m sure it wasn’t an odd EULA. And if I got my cat to click on “I agree”, the cat would not be bound by it, but I would. Yes concur; the cat would not be held legally responsible for any agreement, the person encouraging the behaviour in question would. What is amusing is the thought that a companion animal is yet again participating in the finer points of modern life. Remember the US dogs which registered for the draft in the 60s and the pooch which was accepted as a registered voter in the 2007 presidential election? I know a local dog which agrees to free offers and software trials on behalf of his master. Also a guinea pig with its own email address. Something my cat also insisted was his right! Dave: my daughter has occasionally pressed random keys and done some very odd things to our computer. I wouldn’t put it past her to agree to some contract. SL: why, I’d draft a EULA too if someone paid me to do it. Nothin’ wrong with that. Clarence: I hadn’t heard of the dog-voter in the 2007 election. That’s a classic. I’m sure I’ve heard of a cat with a credit card though. Sounds dangerous to me (suddenly 20 bags of catnip land on your doorstep). Yes, here’s that cat with the credit card: Messiah Campbell. If they do click agree for their people it’s only to humour them. I’m sure they all had a good laugh about it on the catternet that night. Speaking of EULAs, LE. I have a question. A certain piece of software (which will remain un-named) has on the box at the store, the declaration that use of the software is contingent on aditional contracts (the EULA) upon installation. At a number of stores, for-sale boxes are kept out back and display boxes are positioned so as the declaration on the box is not readily accessible to the public. I know different states are different, and that mail-order and Internet purchases are different again. But if sold in a jurisdiction where contracts must be made at the point of sale, not after, would someone making such a purchase be bound by the EULA by clicking “accept”? Would the store (or rather chain of stores) engaging in the obfuscatory practice be liable to the software company for the costs incurred by a EULA-free software user? Bruce, that’s a very interesting question. 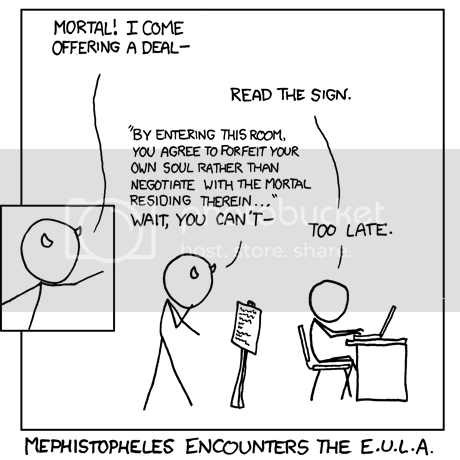 I think a person would still be bound by the EULA if they clicked “I accept” even though they had not been alerted to the fact that in buying the software they would have to enter into a EULA. The important thing is that they are aware of the terms of the EULA itself. As to obfuscating contractual terms – there’s a whole ream of contract cases out there. One of my favourites, Thornton v Shoe Lane Parking, concerns a parking lot where the terms and conditions could only be read once you’d already taken a ticket and entered the parking lot. The ticket merely said, “this ticket is issued subject to the conditions of issue as displayed on the premises”.So you didn’t really have much of a choice as to entering the contract. None of those cases has any application to a ticket which is issued by an automatic machine. The customer pays his money and gets a ticket. He cannot refuse it. He cannot get his money back. He may protest to the machine, even swear at it. But it will remain unmoved. He is committed beyond recall. He was committed at the very moment when he put his money into the machine. The contract was concluded at that time. It can be translated into offer and acceptance in this way: the offer is made when the proprietor of the machine holds it out as being ready to receive the money. The acceptance takes place when the customer puts his money into the slot. The terms of the offer are contained in the notice placed on or near the machine stating what is offered for the money. The customer is bound by those terms as long as they are sufficiently brought to his notice before-hand, but not otherwise. He is not bound by the terms printed on the ticket if they differ from the notice, because the ticket comes too late. In your scenario, this suggests that if the EULA had a really onerous term, and the customer bought the software, but declined to click “I agree” when uploading the software, the onerous term could not apply to the customer merely because of the terms on the back of the box. I am not sure that the shop would be liable in contract, but they could be liable under s 52 of the Trade Practices Act (misleading and deceptive conduct in trade or commerce). Lets imagine the Australian Electoral Commission charges the elector one cent to vote (which is always rounded down within 5 cents, so it actually costs the voter nothing). Now… the notional payment might be considered a contract with the promise of the “product” being the authorized advertisements and statements of party leaders. Ergo… broken promises could give rise to a class action for false representation and breach of contract. With the threat of punitive damages, it could get interesting. Oh, and if the owner doesn’t like the contract the cat created, the cat could be put down… then let the EULA creator chase down the dead cat. Wouldn’t they be able to argue that you compelled th cat to press the button and thereby agreed? Well you culd say prove it. And they could say prove the cat did it. I think that Simba does not have the cognitive skills to understand the ramifications of what he is doing. * Answering email offering 61 million cans of gourmet catfood if it puts in it’s pet human’s credit card number. Dave Bath has a very crude view of cat sensibility. Perhaps it mirrors his own? I have noticed that many men don’t really like cats. My father, my husband and my father-in-law are among them. They think cats are evil beasts. As for myself, I like both cats and dogs, but for different reasons. I wish I was more like a cat in personality (ie, just don’t give a damn, darling, and so elegant to boot), but I suspect I’m a frenetic terrier really. All in the men in my life have been crazy about cats, LE. One ex taught cats to retrieve homemade woolly balls. And my current paramour rescues cats from drains and under bushes and says to the wider homeless cat world in inner Sydney: come one, come all. We’ve now got five friggin’ cats living in the house. And they can go anywhere they like. One great hulking beast likes to sit on top of the mess of wires behind the tv and audio system. Another habitually sprays on the bottom row of books in the floor-to-ceiling shelves in the lounge room (cooking books and dictionaries). I wake in the night and have the damn critters kneading my breasts! Lizzie, I would probably have 5 cats in my house too if not for the unfortunate fact that I am most dreadfully allergic to them (as is everyone else in my household). Sometimes I just have to pat a cat on the sly, but everyone knows that I’ve done it because my eyes instantly swell up. I’m hoping that they do manage to breed those non-allergenic cats. But my husband gave me a very narrow look indeed when I said that apparently they are available in the US for some exorbitant sum. Mind over matter, LE. I was allergic to cats too, asthma, hayfever, the unlovely works. You get over it after a while. It’s like homeopathy, just takes a bit longer. Occasionally I get a bit breathless but nothing serious. Sure sometimes we have to kick one or two off the bed because we can’t move and are hemmed in something awful by these ultra relaxed sprawling sybarites. Can’t complain too much. They do love us so and especially love the softest fabrics and places. As you do. Dave, are you a cat man, or a dog man? Or a have-it-each-way person like me? Unfortunately, really, the only pet I should have is something scaly, but I am not a person who likes lizards. And the difficulty with fish can been seen in this post (it was all my sister’s ex’s fault). [email protected] asked if I am a cat man or a dog man. I’m a huge fan of working dogs (except heelers and terriers) that haven’t had their smarts bred out. Toy dogs don’t count as dogs. (My dog as a kid was a samoyed cross – probably with a lab or border collie). The only cats I like are (1) one that was fostered on a farm by a dog… and it didn’t know it was a cat… would fetch, was a mouser, but was useless with sheep; and (2) the ones wearing blue and white hoops that run about Kardinia Park. As you know, I’m also a huge fan of the magpie family (as long as they don’t wear black and white jumpers) and parrots (not inside though). But in urban areas, unless you can work your dog, I think keeping dogs is cruel. I say if you want a pet, get two female rats; or become a buddy of your local possums, smarter birds (see "On Nature Deficit Disorder" and earlier related posts) as well as skinks if you are lucky enough to have them around. which is why this screenshot from a cat-lover website cracked me up and brought back old memories. Otherwise, they just create an unacceptable risk of schizophrenia for young children (especially in utero). The allergy is to a protein in almost every cat’s saliva (some more than others) which gets on the fur during grooming. Someone in the US has recently bred a hypoallergenic cat that cannot make this protein for (from memory) about $500 a moggie. Lizzie’s description of them as sybarites is spot on… I used to label them in Freudian terms “ids with fur”. Ah ha! So that’s why I get hives all over when a cat licks me (and for some reason, they like me, they’re such contrary things). I even have problems if I hug someone who has cat fur on their coat. I’ve tried exposing myself to cats so that I get used to it, but it’s so severe that I’m a wreck within a few hours – I seriously need a nebuliser. $500 a cat is much better than what I heard. I heard $15,000 a cat. Hmmm…. As for me, I like the big cats. You know, the ones who wear yellow and black and just got Ben Cousins on board. I really hope those big cats do better this season. Last season was, well, the pits. Big cats v small cats…. now we’re on to religion again! It has been accurately said that people own dogs, but cats own people. Anyway getting the cat to walk across the keyboard is a bit like pressing the keyboard with a ruler – the cat is a creature under your control and therefore what it does is imputed to you. There seems to be a serious contradiction between those two paragraphs. DEM, I love, love, love it. They think cats are evil beasts. My grandmother thought cats were the spawn of Satan – literally. She used to push my cat off my bed. Which was outrageous. It was his bed. He just let me sleep there to warm it up. And when he was warm enough he pushed me off. I spent my sixteenth year waking up on the floor a lot at 3am to a cat going: ooh that’s better now I can stretch out! Dave – I like magpies too. Very dignified birds. And when they come over in hope getting a bit of your lunch they’re models of decorum. Nice songs too. Lapdogs are not dogs, they are evil mutants. I’m a working dog person, and never have been hugely fond of cats. I don’t like toy dogs/lap dogs. A decent sized dog around the place has the tendency to make me bounce out of bed in the morning and run it for miles (which has attractive side-benefits for both me and the dog). I’ve noted before (Magpie Morality) how our magpie buddies offer US food too, not just politely ask for it from us. I usually say I am a dog person (I had a mystery-mix that was mainly kelpie as a teenager,who was great hfor exercise-forcing purposes), but as I grow older, I think I am becoming more of a cat person. I envy their utter confidence, their poise, their intelligence – somehow most smart dogs I have known (whether border collies, retrievers, or whatevers) are also very outgoing and gregarious (even the 55kg Rottweiler, who was rather scary), and it’s only the truly dumb ones that have the same sort of elegance as the average cat (Afghan Hounds, for example). I occassionally have nightmares about ending my days, old and alone, in a crumbling, rambling house stuffed full of junk, with six cats who will start eating me before I am missed …..
What’s the other saying about the difference between cats and dogs? When their owner dies unattended, a dog will pine and starve to death. A cat will just eat said owner. My kind of pet, really. Hey I like dogs too. I’d like a Kelpie but they’re too smart and need a job.